Welcome to the My Inky Friends "Love it. Live it. Share it." Blog Hop. This month we are featuring products from the 2018 Occasions catalog. 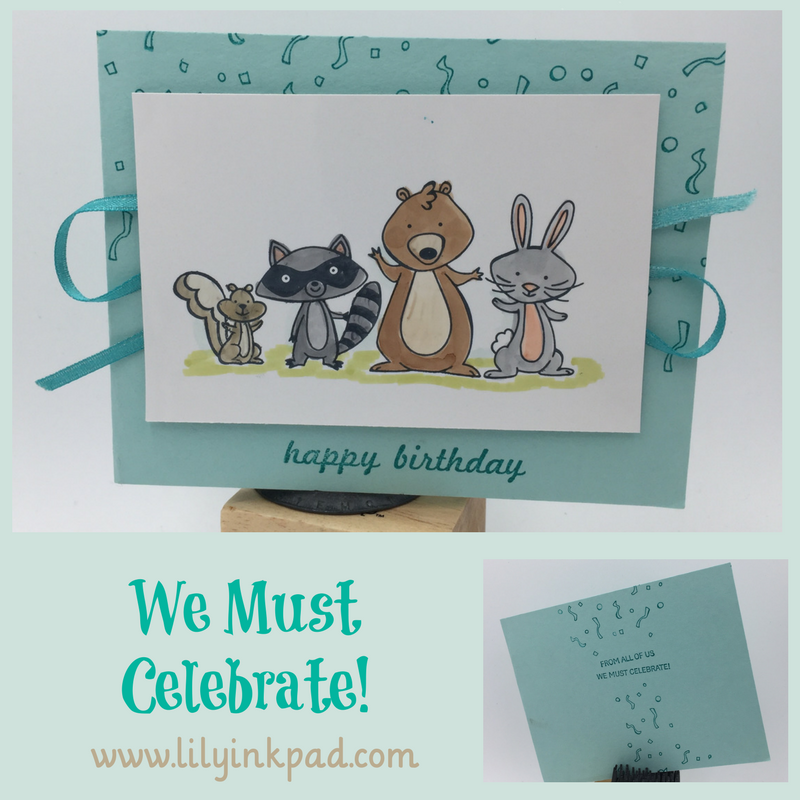 This stop features a cute animal set called We Must Celebrate. If you are already hopping, did you like Yapha's projects with Sunshine and Rainbows? I fell in LOVE with this stamp set as soon as I saw it. I knew it would be perfect for cards at work! As for LIVING, I decided to use the KISS technique on my projects this month--Keep It Simple, Sara. I have three cards with different designs, but the same focal image. 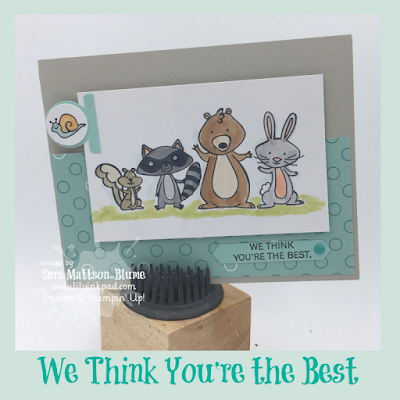 I used my Stampin' Blends on Glossy Paper. I really love the effect. Bright, crisp colors! For this card, I used the ribbon technique from our first My Inky Friends Design Challenge. I like it. The Bermuda Bay Ribbon from the Shimmer Ribbon Pack, which you can earn FREE with a $50 purchase. I used Bermuda Bay repeatedly with the confetti stamp in the set to make the background and added a bit inside...so much fun. My next card used the same image, but with a different flair. I added a second element withe snail on the Circle Tab Punch and placed my sentiment on the Classic Label Punch in Basic Black with an added Enamel Dot for flair. The dot carries the dot theme from the Picture Perfect Designer Series Paper. The circle of the snail also contributes to that idea. Again, I used the Picture Perfect Designer Series Paper. I just love the color combinations of this paper! I added a Basic Black Band for contrast and added my sentiment to a Washi Punch, which I just realized was retired. Sorry about that! Inside, I added a little fun with the mushroom family. 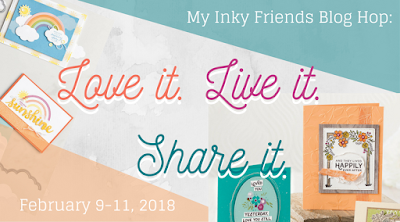 Now, I am SHARING with all of you and the My Inky Friends Team! I hope you like my projects. Next up you'll find Tanya's AMAZING projects with the Waterfront stamp Set. Or, you could go back to see Yapha's Sunshine and Rainbows! Here is a supply list. Feel Free to CASE (copy and share everything) my cards! Sara! Love these happy cards. I've not tried the Blends with Glossy White paper. Hmm I love the look. The last card is my fav, really pops! Thanks for the inspiration! Super cute cards, Sara! And your coloring is fabulous! I love the different layout options you've illustrated with your projects. Such cute little guys! 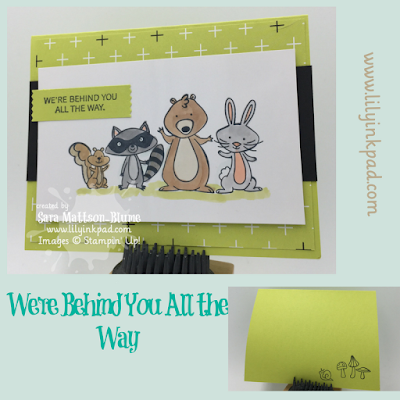 I love the "We're behind you all the way" sentiment with all of the animals! It's perfect. I also really love how you added the snail to the second card with the circle tab punch. I think I could just make a bunch of cards with the snail. All of the cards are so cute. I can see why fell in love with set immediately. These are adorable! The coloring is great! I LOVE these little guys! Your cards are super cute! I love the way you showed how the tone of the project changes by changing the background but keeping the focal point the same. Great projects! Those furry little guys are adorable! I love how you colored them. I will have to pull out my glossy paper and give this a try. How cute are these guys?! Love your designs and coloring! !